Makino Tsukushi is the only poor student at Eitoku Gakuen, the school of the ridiculously rich and privileged that is ruled by Flower 4 or F4, a group of four boys who come from extremely powerful families: Domyoji Tsukasa, the leader and heir of the Domyoji World Finance Group; Hanazawa Rui, the introverted son of a large company; Nishikado Sojiro, a player who is the heir of a tea ceremony school; and Mimasaka Akira, a madam killer with ties to the underground. If a student gets on the F4’s bad side, he/she gets a red notice and is bullied and driven out of school. Makino hopes to pass her days quietly-- without drawing any attention to herself-- but one day, she stands up to Domyoji in defense of her friend. The next day, Makino gets the dreaded red notice. Even though she is harassed, Makino decides to keep going to school because she is a “tough weed”. She declares war right back on the F4. Her resolve gets the attention of her crush Hanazawa Rui and oddly enough, rouses romantic feelings in her worst enemy, Domyoji Tsukasa. 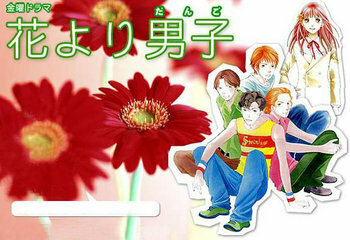 The series is based on the Japanese shoujo manga "Hana Yori Dango" (Boys Before Flowers) by Kamio Yoko.